Riv’s Air Brake Compressors is a proud wholesale supplier of air brake compressors, air dryers, clutch servos, air valves, air disc brake calipers, repair kits and hardware, supplying the retail industry since 1994. 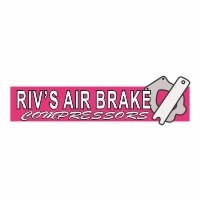 Rivs Air Brake Compressors is a proud wholesale supplier of air brake compressors, air dryers, clutch servos, air valves, air disc brake calipers, repair kits and hardware, supplying the retail industry since 1994. Rivs products are ISO certified and are of excellent quality. Our parts are directly imported from our exclusive international suppliers to meet our customers’ demands at competitive prices. Our owned premises of 1200 sqm in Johannesburg receives ongoing shipments monthly, making our stock readily available for your needs. With Rivs staff, compliment of 25, and many having hands on experience and intimate knowledge of the entire air brake system, we confidently and efficiently offer a full backup warranty of our products. We also offer reconditioning of most air brake components, with inhouse machining and engineering that are tested with calibrated test benches before being returned. We also offer a free courier / delivery service throughout South Africa for our loyal customers. An additional service on offer to our loyal customers, the facilitating & organising a repair of any air brake problem for their customer at one of our country wide distributors.